Orifice plate mounted in flange and alone. An orifice plate, at its simplest, is a plate with a machined hole in it. Carefully control the size and shape of the hole, mount the plate in a fluid flow path, measure the difference in fluid pressure between the two sides of the plate, and you have a simple flow measurement setup. The primary flow element is the differential pressure across the orifice. It is the measurement from which flow rate is inferred. The differential pressure is proportional to the square of the flow rate. Orifice plates are the most commonly used differential pressure measurement device and are applicable for measurements in gases, clean liquids, and low velocity steam. Orifice plates allow for relatively easy installation and replacement if necessitated by changes in process parameters or life cycle deterioration. An orifice plate is often mounted in a customized holder or flange union that allows removal and inspection of the plate. A holding device also facilitates replacement of a worn orifice plate or insertion of one with a different size orifice to accommodate a change in the process. While the device appears simple, much care is applied to the design and manufacture of orifice plates. 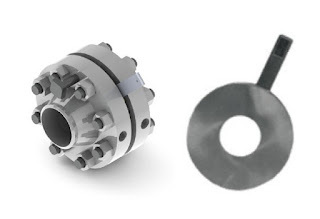 The flow data obtained using an orifice plate and differential pressure depend upon well recognized characteristics of the machined opening, plate thickness, and more. With the pressure drop characteristics of the orifice fixed and known, the measuring precision for differential pressure becomes a determining factor in the accuracy of the flow measurement. Orifice plate configurations (click for larger view). Orifice plates can be effectively "reshaped" by corrosion or by material deposits that may accumulate from the measured fluid. Any distortion of the plate surface or opening has the potential to induce measurable error. This being the case, flow measurement using an orifice plate is best applied with clean fluids. Certain aspects of the mounting of the orifice plate may also have an impact on its adherence to the calibrated data for the device. Upstream and downstream pipe sections, concentric location of the orifice in the pipe, and location of the pressure measurement taps must be considered. Orifice plate between two flanges. Properly done, an orifice plate and differential pressure flow measurement setup provides accurate and stable performance. Share your flow measurement challenges of all types with a specialist, combining your own process knowledge and experience with their product application expertise to develop an effective solution. Download a cut sheet for Armstrong orifice plates and flanges from this Mead O'Brien link. For more information, call (800) 892-2769 or visit https://meadobrien.com. For steam, energy is primarily contained in the latent heat and, to a lesser extent, the sensible heat of the fluid. The latent heat energy is released as the steam condenses to water. Additional sensible heat energy may be released if the condensate is further lowered in temperature. In steam measuring, the energy content of the steam is a function of the steam mass, temperature and pressure. Even after the steam releases its latent energy, the hot condensate still retains considerable heat energy, which may or may not be recovered (and used) in a constructive manner. The energy manager should become familiar with the entire steam cycle, including both the steam supply and the condensate return. When compared to other liquid flow measuring, the measuring of steam flow presents one of the most challenging measuring scenarios. Most steam flowmeters measure a velocity or volumetric flow of the steam and, unless this is done carefully, the physical properties of steam will impair the ability to measure and define a mass flow rate accurately. Steam is a compressible fluid; therefore, a reduction in pressure results in a reduction in density. Temperature and pressure in steam lines are dynamic. Changes in the system’s dynamics, control system operation and instrument calibration can result in considerable differences between actual pressure/temperature and a meter’s design parameters. Accurate steam flow measurement generally requires the measurement of the fluid’s temperature, pressure, and flow. This information is transmitted to an electronic device or flow computer (either internal or external to the flow meter electronics) and the flow rate is corrected (or compensated) based on actual fluid conditions. 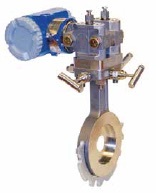 The temperatures associated with steam flow measurement are often quite high. These temperatures can affect the accuracy and longevity of measuring electronics. Some measuring technologies use close-tolerance moving parts that can be affected by moisture or impurities in the steam. Improperly designed or installed components can result in steam system leakage and impact plant safety. The erosive nature of poor-quality steam can damage steam flow sensing elements and lead to inaccuracies and/or device failure. The challenges of measuring steam can be simplified measuring the condensed steam, or condensate. The measuring of condensate (i.e., high-temperature hot water) is an accepted practice, often less expensive and more reliable than steam measuring. Depending on the application, inherent inaccuracies in condensate measuring stem from unaccounted for system steam losses. These losses are often difficult to find and quantify and thus affect condensate measurement accuracy. For steam three differential pressure flowmeters are highlighted: orifice flow meter, annubar flow meter, and spring-loaded variable area flow meter. All differential pressure flowmeters rely on the velocity-pressure relationship of flowing fluids for operation. Historically, the orifice flow meter is one of the most commonly used flowmeters to measure steam flow. 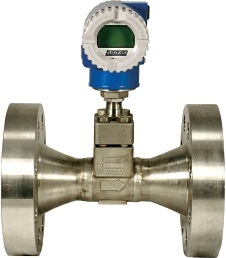 The orifice flow meter for steam functions identically to that for natural gas flow. For steam measuring, orifice flow flowmeters are commonly used to monitor boiler steam production, amounts of steam delivered to a process or tenant, or in mass balance activities for efficiency calculation or trending. The annubar flow meter (a variation of the simple pitot tube) also takes advantage of the velocity-pressure relationship of flowing fluids. The device causing the change in pressure is a pipe inserted into the steam flow. The spring-loaded variable area flow meter is a variation of the rotameter. There are alternative configurations but in general, the flow acts against a spring-mounted float or plug. The float can be shaped to give a linear relationship between differential pressure and flow rate. Another variation of the spring-loaded variable area flow meter is the direct in-line variable area flow meter, which uses a strain gage sensor on the spring rather than using a differential pressure sensor. The two main type of velocity flowmeters for steam flow, turbine and vortex shedding, both sense some flow characteristic directly proportional to the fluid’s velocity. A multi-blade impellor-like device is located in, and horizontal to, the fluid stream in a turbine flow meter. As the fluid passes through the turbine blades, the impellor rotates at a speed related to the fluid’s velocity. Blade speed can be sensed by a number of techniques including magnetic pick-up, mechanical gears, and photocell. The pulses generated as a result of blade rotation are directly proportional to fluid velocity, and hence flow rate. A vortex-shedding flow meter senses flow disturbances around a stationary body (called a bluff body) positioned in the middle of the fluid stream. As fluid flows around the bluff body, eddies or vortices are created downstream; the frequencies of these vortices are directly proportional to the fluid velocity.